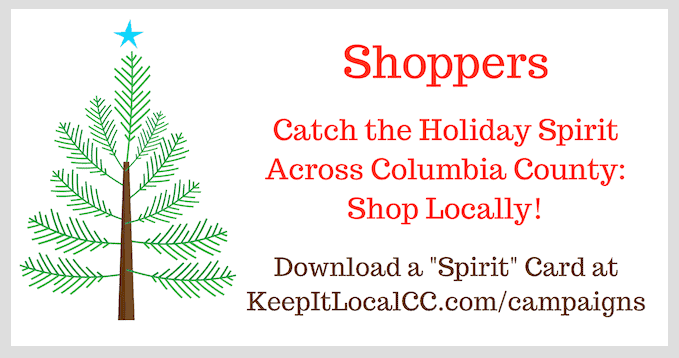 Keep It Local Columbia County has a goal of helping citizens find their local businesses to promote shop locally for so many reasons! Catch the Holiday Spirit Across Columbia County is celebrating it’s 3rd year in 2018. Please, read further to learn more about the campaign that starts Nov 16th runs thru Dec 28th. Catch the Holiday Spirit Across Columbia County! Thank you for participating! By supporting your local businesses, you help ensure local jobs, businesses, and vibrant communities where you live. Unique gifts and great customer service are right at your fingertips. Remember that many local businesses also offer Gift Cards. Ready 2nd week in November. Please check back to print off cards. Shop at Columbia County businesses from Nov 16 through Dec 28! For each $10 you spend at a participating local business, you get a box checked off on your Spirit Card. Once 20 boxes are filled, submit your Spirit Card in your hometown to be entered for the Community Prize Drawing for up to a minimum of 3 Prizes valued at $50.00 each on December 28. All participants will also be automatically entered in the Columbia County Prize Drawing on January 5 prize valued at $150.00. Thank you to Wauna Federal Credit Union for your sponsorship of this program for the 3rd year in a row.